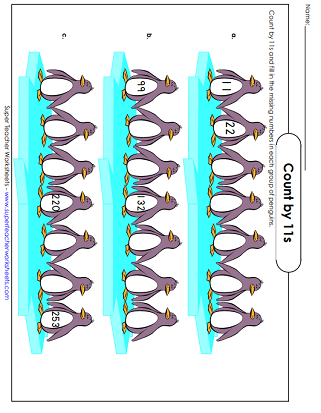 These printable worksheets can be used to help your students learn to count by 11s. Count 11, 22, 33, 44, 55, 66, 77, 88, 99, 110, 121, 132 and so on. Count by elevens and fill missing numbers in the boxes. This worksheet has a music theme. Skip count by 11s. Write the multiples of 11 on the tummies of the Arctic penguins. Write the multiples of eleven on the balloon pictures. Numbers go from 11 all the way up to 264. Complete the missing sections of the caterpillar as you skip count by 11s. Fill in the missing numbers as you skip count by 11s. Then answer the related questions that follow. Help the mouse find the cheese by counting by 11s. Write in the missing numbers in the circles on this printable skip-counting worksheet. Practice counting by 2s, 3s, 4s, 5s, 6s, 7s, 8s, 9s, 10s, 12s, 25s, and 100s. 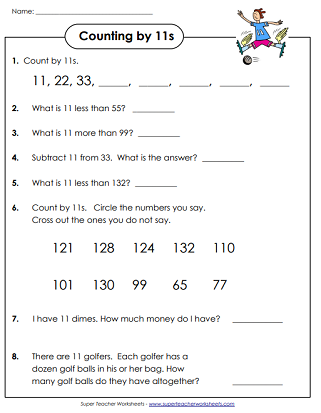 Learn basic multiplication facts with these worksheets from Super Teacher Worksheets.